From beautiful Burgundy, we packed our bags, hopped a train, and traveled to Normandy. Mom requested a stop in this northern region to observe the historic D-Day beaches. We also fit in a trip to Mont Saint-Michel, a rocky tidal island and commune dating back to the 6th century. In between our two chief sightseeing adventures, we had a stupendous feast of Norman delights at Manoir de l’Acherie. 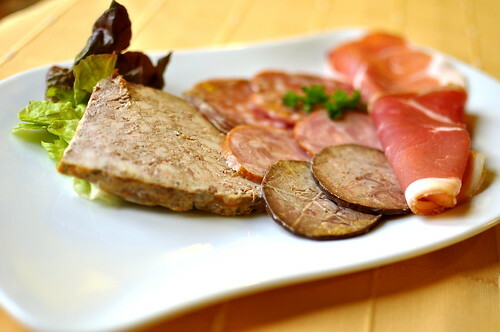 Dining in charming, family-owned restaurants serving local specialties was the highlight of exploring the French countryside. I hope to make a whole vacation of inn-hopping in the future. 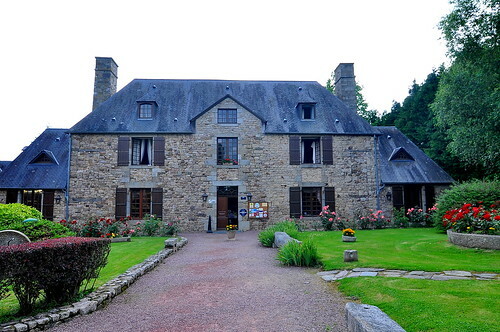 The restaurant was located on the first floor of the Le Manoir de l’Acherie inn. Our reserved table was beautifully set in the French tradition upon arrival. The textured, pale yellow tablecloth and napkins were jazzed up by bold chargers. 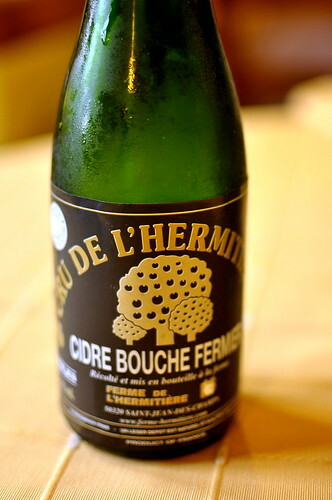 While mom sipped a glass of red to start, The Astronomer and I shared a bottle of cidre (4.50€)—a specialty of the region. Whereas the ciders we’ve sampled in America are sweet, bubbly, alcopoppy creations, the stuff made in Normandy is legitimately funky with just a splash of fruitiness. The scent of the cider reminded The Astronomer and me of the pungent goat cheese shop we visited in the Loire Valley. The essence took some getting used to, but by the end of the bottle we were both big fans. 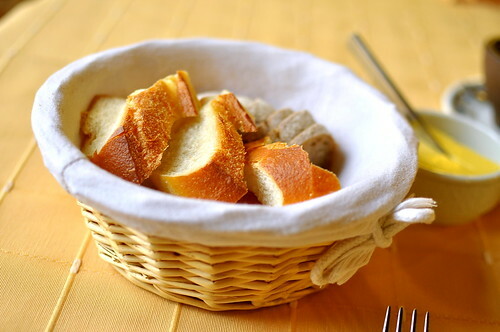 Two types of bread were available this evening—a French loaf and brown bread. 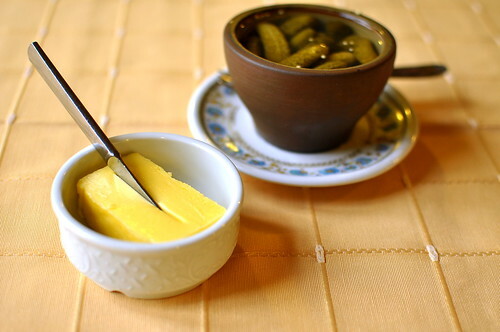 Butter and cornichons were also on hand to spread and nibble as we pleased. The Astronomer and I selected a three-course dinner (27€), while Mom was perfectly content with a starter and a main course (19€). Mom chose the charcuterie assortie for her first course. The collection of hams, salamis, and forcemeats were lovely, but I’m pretty sure she loved the snappy little gherkins served on the side most. 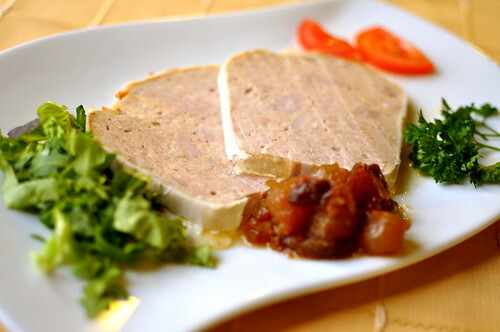 The Astronomer’s terrine de lapin au calvados was served with a sweet apple and raisin chutney on the side. The generously portioned rabbit terrine was well constructed and mildly flavored. I selected the richest entrée on the menu, the gratin d’andouille au Camembert. 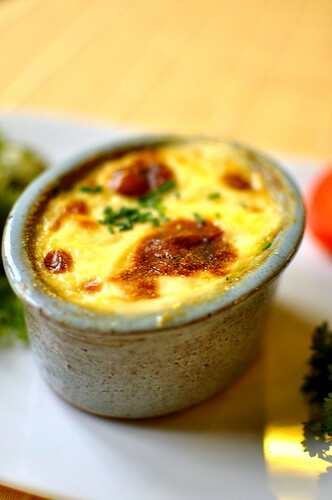 Served hot-from-oven, the ramekin was filled with a molten mix of potatoes, sausage, and cheese. 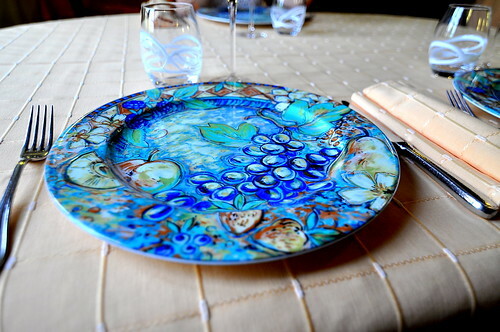 While it was far too over-the-top for me to finish on my own, my dining comrades were more than happy to help out. 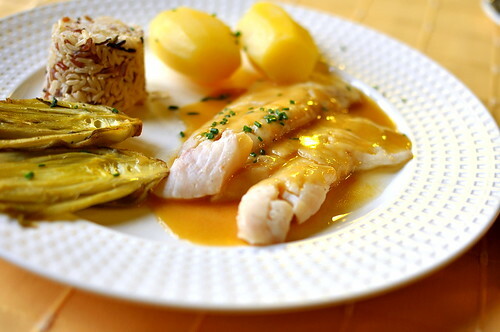 Mom’s main course was the filet de dorade sauce au poire, which consisted of flaky white fish dressed in a sweet and tart pear sauce. On the side were butter poached potatoes, roasted fennel, and wild rice. The fare was simple, hearty, and made with care. 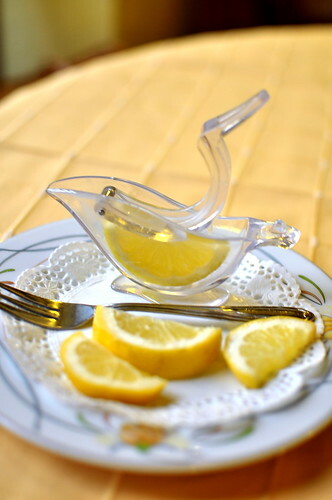 This adorable lemon juice squeezer was served alongside the fish. 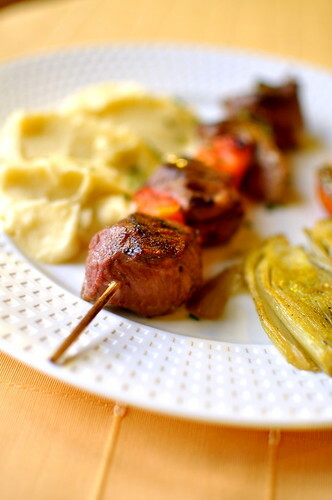 The Astronomer ordered the brochette d’agneau grillee au feu de bois because he had heard that the region’s lambs had a unique flavor and texture due to grazing in the salt marshes. Unfortunately, the lamb served this evening wasn’t of the agneau de pré-salé variety and tasted fairly standard. Still, the wood fire grill imparted a nice char. 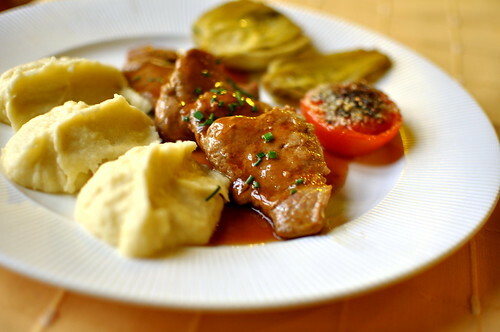 I chose the filet mignon de porc sauce au cidre because pork and apples make an excellent team. The mashed potatoes served alongside were the very definition of comfort. 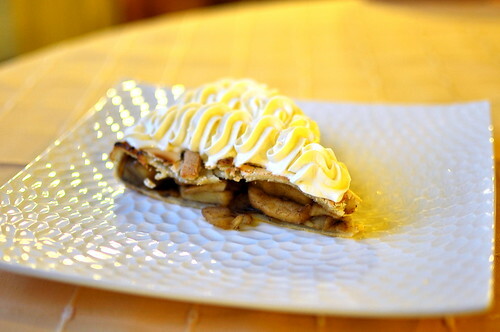 The Astronomer ordered his slice topped with chantilly (tarte Normande tiede chantilly). The sweetened whipped cream paired marvelously with the cinnamon-tinged fruit. 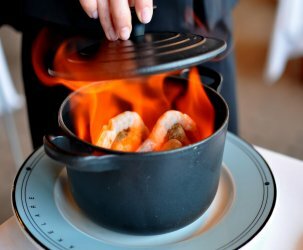 I was feeling a little fancy, so I ordered the tarte Normande tiede flambe au calvados. 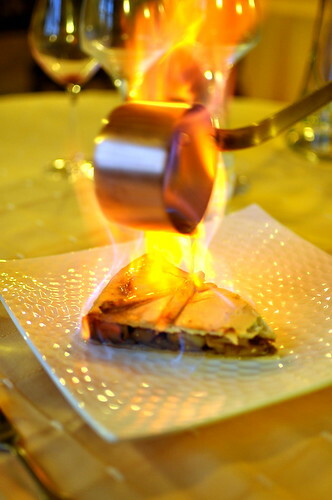 The tart was flambéed with a locally made apple brandy at the table. What a sight! Even though we didn’t have enough time in Normandy to visit the local orchards, cider and calvados operations, and dairy farms, our dinner at Manoir de l’Acherie provided a wonderful introduction to the region’s ingredients and specialties. Two years ago: Baked & Wired – Washington D.C. Your gratin and filet mingon look atrociously delicious…who could ever pass up camembert in ANY form-much less melted? 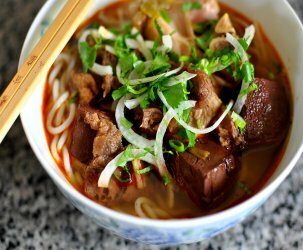 This looks like a great, comforting meal. How are you able to travel for such long periods of time? Are you independently wealthy? Are there big bucks in astronomy? I’m ridiculously jealous…. Flambé! That gratin looked ready to burn someone’s tongue, amiright? Mmm I would have loved to try the cider. Good choices with the pork and apple combo and too bad the lamb wasn’t the special kind. Flaming tarte?! YES! Visiting napa for my first time. Celebrating 20 year anniversary. 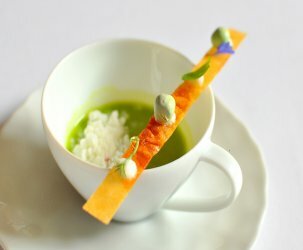 Can anyone help or suggest how to get a reservation at The French Laundry? The week of the 15th of October.